Attractive and very affordable, the Stratus ships in kit-form and is easily put together in minutes using a simple screw driver. The kit includes a 2" thick, 24" x 48" acoustic panel made from high density 6lb per cubic foot glass wool and suspension hardware. The glass wool is encapsulated with micromesh and the edges are resin treated to retain the minute fibres. For an attractive appearance, the panel is covered in an acoustically transparent fabric. The suspension hardware consists of two lightweight aluminum rails and "L" brackets that form a rigid frame around the panel. To hang the Stratus, simply attach the included suspension wire to the frame. Hardware and fasteners for sheet-rock ceilings are included in the kit. Typically, the Stratus would be suspended above the console and clustered in an array spanning the width of your console and listening. The Stratus absorbs sound energy by converting it to heat. Sound energy traveling via air vibrations penetrates the panel causing the minute glass fibres to vibrate and generate heat. This thermo-dynamic energy transfer effectively absorbs directional sound energy and prevents it from reflecting into the mix position. By itself, the 2" thick glass wool panel is 100% effective for frequencies between 400Hz and 20kHz (see the acoustic absorption chart). To help control a broader frequency spectrum, the Stratus may be angled to vary the air space between the Stratus and the ceiling. 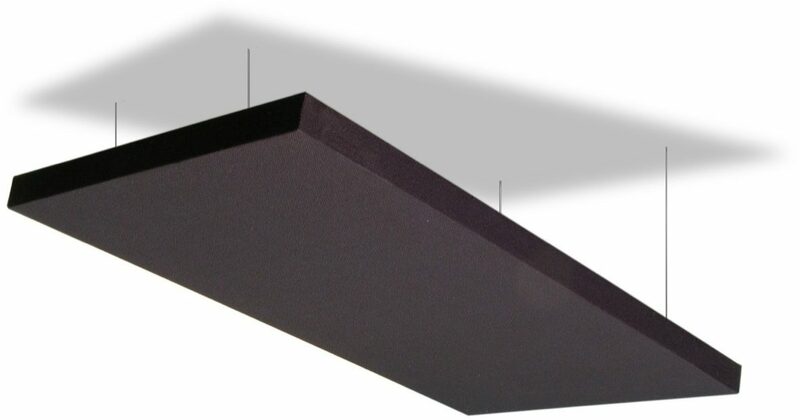 This allows the backing surface to also absorb reflections off the ceiling. zZounds is an authorized dealer of Primacoustic products.